“Whiplash” reminded me of my fond days in a middle school jazz band. The beats, the rhythm and the smooth feel of the songs that differed from the strict and pomp “Kitty March” or “Sleigh Ride.” Concerto pieces were standard and stuck to a beat while jazz was more loose and felt like a song that could keep going on. But I can’t say the egos in the club were brutal. I still have the sax as of this review but regardless of the film’s brash tone, I looked back on my music days and wondered. Had I continued in this course, would the stakes be raised or would there be something else in store? Based on the true experiences of director Damien Chazelle, it follows the journey of first-year jazz student Andrew Neiman (Miles Teller) who is determined to live up to his idol Buddy Rich by joining a studio band course. Ever since he was young, Andrew has set his sights on the drums to the point he wants to prefect his craft even the point he bruises his hands. That wouldn’t be such a problem if it wasn’t for the conductor Terence Fletcher (J. K. Simmons) who goes beyond the term “teacher from hell” as he keeps pushing his students to the point of using verbal insults and aggression that makes Lee Ermey’s Drill Instructor in Full Metal Jacket look soft. What sounds on paper appears to be a battle of teacher and student when the last 40 minutes reveal it to be a battle of egos. 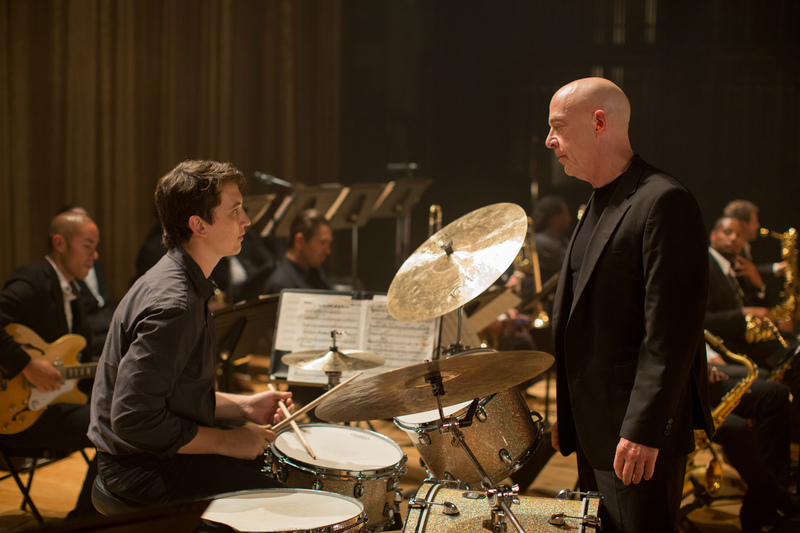 Without giving too much away, “Whiplash” fools us into thinking its the “typical hard edge teacher” against the “student that will go far and succeed” type of story. We are led to think that Terence is the true source of conflict when he really isn’t. There are moments that show he’s not a hard character but a human being. He shares the same feeling of perfection that Andrew has; a strive to make a new “Charlie Parker.” He delights in seeing a young cousin and shows his respect when someone dear to him dies. Perhaps that is what makes “Whiplash” work so well is how no conflict exists. Its tension between a man who wants to make the perfect band and a kid who wants to be the next musician to turn the tide. Earlier in the month, I managed to view “Foxcatcher” and while that was a unique portrayal of egos it happened to be a darker one. Some viewers might find it to be unsettling to see band members getting chewed out with harsh words but it depends on what view you have. When J.K. Simmons was on screen, I didn’t see a bully but a man striving for a perfect sound. You can see for yourself in the first rehearsal scenes when he is listening for a beat or when he catches a sour note. He doesn’t get stirred unless what bothers him continues to play on. The character of Andrew is also interesting too as he keeps all distractions from the side and focuses on being perfect as a percussionist. However, I would have liked to see more of the distractions kick in a bit or at least see more on the consequence of his choices. There is a moment when he gets a girl but abandons her for his passion and yet we see her fate later on without much effect. This kid is surrounded in so much isolation to the point it makes me wonder what would happen if he tried to be social once he looses his ambition. Would it change him or keep the same passion? A little more of that would have giving a bigger depth to the character other than stick to the drums. But would it bring the tragedy of Andrew or strength him? By the end, “Whiplash” still satisfied in the areas addressed before. I liked the performances with their realistic “unpolished” feel, the Terrance character and most important is the sound editing. Very rarely do I praise a movie based on its sound, though its shot beautifully as well. This was caught early on when Andrew plays in the studio band for the first time as alternative core drummer. When we hear him play, we hear those drums banging and far more than the rest of the brass or treble instruments. When its someone else, we barley get a margin of what they are performing as all is focused on Andrew’s work. Its award for Best Sound Mixing at the Oscars is truly deserved. Posted on March 28, 2015, in Rental Corner and tagged drums, J. K. Simmons, jazz, Miles Teller, studio band, Whiplash. Bookmark the permalink. 2 Comments. AMERICAN SNIPER Won Sound Editing!.